Here are the ten most popular news articles, week ending 19th June 2016, covering catastrophe bonds, ILS, reinsurance capital and related risk transfer topics. To ensure you never miss a thing subscribe to the weekly Artemis email newsletter updates. The world’s largest insurance linked investment manager Nephila Capital and insurance giant Allianz are working together on blockchain technology for catastrophe risk trading, betting on the ability of insurance technology (insurtech) to make underwriting and investing in catastrophe risk more efficient. The world of disaster risk transfer and financing for the developing world and development communities is getting increasingly interesting and relevant to the ILS world, with the latest news being the imminent launch of Global Parametrics, a parametric risk transfer provider backed by a third-party capitalised risk fund. Total reinsurance capital grew again at the end of 2015 as the lack of large loss events, growth of third-party capital and ILS resulted in an abundance of reinsurance capacity, meaning a $200 billion loss event may be required for any significant impact on rates to materialise, according to analysts at Macquarie. 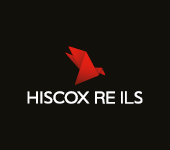 The Florida Hurricane Catastrophe Fund (FHCF) has completed a $1 billion renewal of its private reinsurance cover, the second year the fund has looked to private sources of traditional and third-party risk capital to offload the risk of severe a hurricane season. The low-cost and abundance of reinsurance capital, both from traditional and alternative or third-party sources, is enabling some insurers to play the reinsurance arbitrage game, as they exploit price disparities with direct insurance, according to S&P. Despite impressive growth and increased maturity of the ILS market in recent times Cory Anger of GC Securities, feels that in order to mitigate the intensely competitive catastrophe re/insurance markets, alternative reinsurance capital products must expand and broaden their reach. Fundamental changes to the requirements and abilities of reinsurers has created an industry that’s unrecognizable from previous years, and with rapid change expected to continue and additional re/insurance consolidation predicted, reinsurance brokers have suggested further sector transformation. Insurance giant Zurich is considering leveraging the capital markets and ILS investors as a way to offload more bank related operational risk, in similar arrangements to the recently completed Operational Re Ltd. deal for investment bank Credit Suisse. Global financial services ratings agency A.M. Best has delivered a stark warning to reinsurers, stating that in the current softening landscape, comprehensive strategies and discipline might not be enough for some to endure further challenges. The impending release of new insurance-linked securities (ILS) legislation by the UK government could help the London insurance and reinsurance market take on a more active role in creating products to support resilience in developing markets, according to the LMG’s CEO. This is by no means every article published on Artemis during the last week, just the most popular, some of which were published over a week ago. There were 26 new articles published in the last week. To ensure you always stay up to date with Artemis and never miss a story subscribe to our weekly email newsletter which is delivered every Wednesday. We’ve now published our Q1 2016 catastrophe bond & ILS market report. 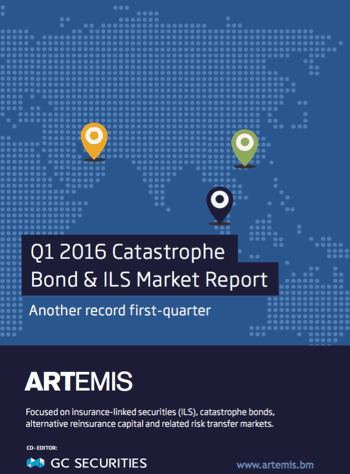 This report reviews the catastrophe bond and insurance-linked securities (ILS) market at the end of the first-quarter of 2016, looking at the record $2.215 billion of new risk capital issued and the composition of the cat bond & ILS transactions completed during Q1 2016. The report also includes a review of global property catastrophe reinsurance pricing trends and commentary on dedicated reinsurance sector capital from co-editor GC Securities.